You can teach a six month old baby to swim. You can teach a one year old child to read. You can teach an eighteen month old child, math. You can teach a two year old child, gymnastics. You can teach a thirty month old child, music. You can teach a three year old child to identify flags of a hundred different countries. You can teach a four year old child, all relevant information about the whole world. You can make a six year old child, a genius. Ru Education has exclusive expertise in the field of child brain development. This is customized as “Genius talent development program” and offered for making any child, a genius. All you need to do is to register your child by filling up the form giving basic details. You will receive a proforma invoice giving details of the customized ‘genius talent development program’ for your child. The program becomes operational once you pay up the necessary fee as per the proforma invoice through the payment Gateway. 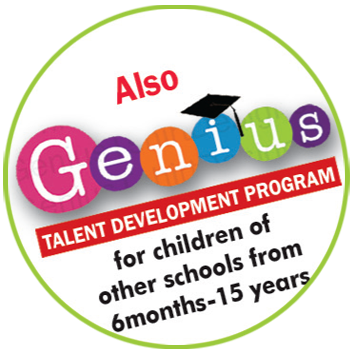 ‘Genius Talent Development Program’ is independent of any schooling program that the child may undergo, and does not, in anyway, interfere with the schooling program. While Parents can sign up anytime for children from 0 to 6 years age, maximum talent actualization is possible if the child is put through the program as soon as possible after birth. What’s more, the ‘Genius Talent Development Program’ is implemented by the mother herself at home. 1) A multiple intelligence test to determine the child’s strengths, areas of improvement and right talent development method. a) Plan to activate Visual, auditory, tactile, mobility, language and manual competencies in the child. b) Necessary resource materials, DVDs,CDs. c) Suggested physical exercise program. 3) Year wise plan of activities, resource materials and guidance. 4) Ongoing on line counseling.